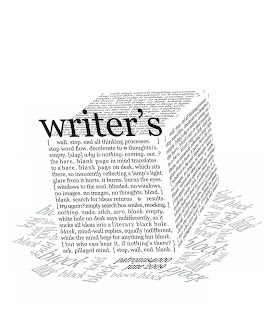 Writer's Block is an issue that we will forever be discussing. I don't think it will ever go away. There can be so many reasons why we get writer's block. Maybe there is something happening in our daily lives preventing us from writing. Or maybe the stresses of the office are getting in our way. Maybe we simply have too many things to balance, and we feel like we don't even have time to sit down and think. For the past couple of months I myself have been dealing with issues in my personal life, and I have had writer's block. I have come to the conclusion however, that it could possibly be just a state of mind. I have found that if you just sit down and stare at the blank page long enough, the words will come. If you find that nothing is coming to you, try stepping away for a few minutes, but make sure it is only a few minutes. Be sure to go back and at least attempt to write something down. I was talking with a close writer friend of mine, and I was telling her how I felt like I couldn't write anything. She suggested that I turn on my radio, or my itunes. She told me that for her, hearing a song can trigger an idea for a story. Sometimes even just a title of a song might help her come up with something to write. I thought, "Duh! Why didn't I think of that?!" How do you handle writer's block? Do you have any special rituals that help you get your creative juices flowing? Thanks for stopping by my blog and following. It's funny that we ended up blogging about the same topic, lol. I guess we're all plagued with the dreaded writer's block! Writers block... arg. I had it all my life (no joke) until last February. Listening to music always help me get out of the writer's block funk. For instance, my most recent photo journalism story Invisible Man was inspired by a lyric I heard in Gill Scott Heron's "Or Down You Fall" and the current piece I'm working on was inspired by Madonna's Vogue. Music definitely plays a big part in all my writing & photography. Thanks for following my blog! I'm following your now too. I like to look at pictures to get rid of my writer's block. I write fantasy, so looking at fantasy art really frees up my mind. Sometimes going for a walk with the dog helps as well! I type nonsense words getting my fingers in motion and after a bit real words begin to come. I read. I get deep into the words of another until my own come back. I find it doesn't have to be the same writing style, I just have to get lost in it. And if it's a good book, it's a good lesson and a good break. Best of luck you're back soon! I usually read. That will usually get me out of a slump.